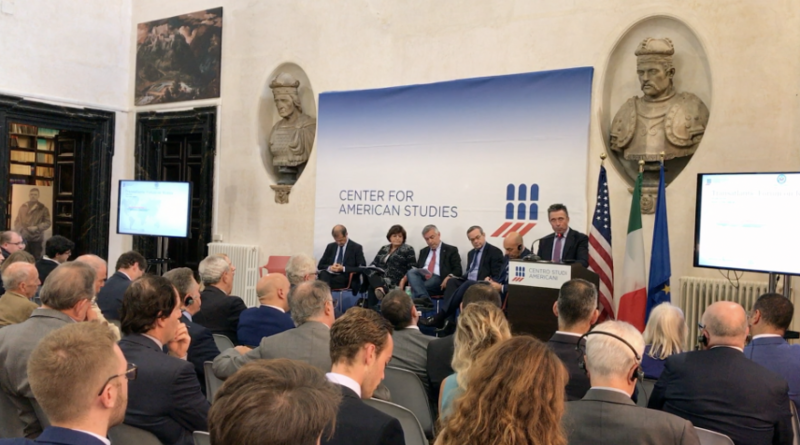 On Friday 13th October 2017, Anders Fogh Rasmussen delivered a speech to the Centre for American Studies in Rome. During the speech he reminded that on NATO’s Eastern and Southern flank, there is a common thread that must never be forgotten: the enduring strength of the transatlantic alliance. Not since the end of the Cold War has there been a stronger imperative for Transatlantic solidity and unity in our dealings with Russia. So, allow me to begin by congratulating you on the organisation of this conference, and I anticipate it will be emulated across Europe and the USA. 15 years ago, I came to Rome as Prime Minister of Denmark. The purpose was to represent my country at the NATO/Russia summit. The meeting with President Putin marked a new chapter in our relations. A chapter as strong partners tackling our common security challenges of Al Qaeda and weapons of mass destruction. 15 years later and we have entered another new and much darker chapter in our relations with the Russian Federation. Let me be clear: this was not through NATO’s actions, but through Russia’s. Italy knows only too well – as the entry point for hundreds of thousands of migrants and refugees –that security challenges in one country can have a major impact on others, thousands of kilometres away. Against this backdrop, I have been asked to speak about the role of NATO vis-à-vis Russia both in Europe’s eastern flank, and along its southern flank. In many aspects, the challenges are not dissimilar. Moscow seeks to use every opportunity to destabilise western democracy and society through its hybrid warfare tactics. Eastern Europe has been the flash point for the breakdown in NATO/Russia relations. In 2014, Russia used the cover of Ukraine’s Revolution of dignity to illegally annex Crimea, and to launch a proxy war along Ukraine’s eastern border. This was the first time since the Second World War that European borders were redrawn through military force. They were redrawn by a country that had pledged to defend Ukraine’s territorial integrity as a quid pro quo for Ukraine surrendering its nuclear arsenal under the Budapest Memorandum. Despite the negotiation and signature of the Minsk Agreements, Russia has taken no efforts to improve the security situation in eastern Ukraine. Indeed, in many cases the security situation has continued to deteriorate and the humanitarian situation is becoming critical. Training by NATO allies has significantly improved Ukraine’s armed forces. However, they still lack basic tools to defend themselves. In the Donbas, I asked the soldiers what they need. Not one asked for lethal weapons. Instead, they requested night vision goggles and radar for detecting enemy batteries: basic defensive systems that we could and should supply immediately. President Trump has such a proposal on his desk right now and I believe he should sign it. And if Russia objects to providing defensive systems then it is because Moscow intends to continue the attacks. NATO allies have the ability to increase the costs to Putin for his actions. NATO can play a role in driving him to the negotiating table. But it does not have the tools to act as a negotiator. That role should fall to the so-called Normandy Partners, France and Germany, and the UN Security Council. Facing the prospect of new US defensive support for the Ukrainians, alongside strengthened US economic sanctions, President Putin made a proposal to the UN Security Council for a peacekeeping force in the Donbas. Closer inspection of Moscow’s draft resolution showed it to be a typical Putin bluff, contradicting numerous UN principles making it unacceptable in its current form. But instead of dismissing it, I believe the West should call the bluff and reshape Moscow’s latest trap into a window for peace, using a combination of carrots and sticks. These would include giving the peacekeepers a robust mandate to enforce a ceasefire right up to the Russia-Ukraine border. If there is a window to end this conflict bleeding in the heart of Europe then I believe we should not be shy to explore it without relinquishing our position of strength. However, so long as Russia continues to adopt an aggressive posture on NATO’s eastern flank, the Alliance must not falter in its efforts to protect itself. At my final NATO summit as Secretary General in Wales, we agreed to deploy multi-nation battle groups along NATO’s eastern border to guarantee our territorial defence. The premise is simple: in order to enter Polish or Baltic territory, Russian troops would have to pass through the forces of several NATO allies, including US, British, French troops and 160 Italian troops stationed in Latvia. The territorial defence has proven to be a powerful deterrent against further Russian expansion eastwards. It acts in a purely defensive capacity, keeping Russian forces at bay. The territorial defence represents a conventional NATO response to Russian aggression. However, Moscow’s deployment of hybrid tactics – including cyber-attack, hacking, strategic communications or ‘fake news’, and election interference, are all less tangible targets for NATO to defend against. At the Warsaw summit, NATO allies agreed to strengthen their cyber defences and NATO recognised cyber as a domain of its operations. Working with the EU, NATO is beginning to improve its defences, but we have a long way to go in this field. Turning to NATO’s role in its southern flank, firstly, I will say a few words about Libya. I was NATO Secretary General during the Libya crisis and from an early stage I was in favour of an international action to protect the Libyan people from a massacre by Gaddafi’s forces. The crisis in Libya highlighted to me how the USA had become the world’s reluctant policeman. From an early stage, the USA did not wish to be seen to be entering a its third conflict in a Muslim country in a decade. This changed after the Arab League asked for an international intervention. No longer was this a western-imposed solution, but a locally backed one. The world against a brutal dictator, not the US and NATO versus an Arab state. The operation mounted under NATO’s umbrella following the adoption of UN Resolution 1973 was impressive. However, the political follow-up was almost non-existent. The USA expected the UK and France to lead on a post-conflict political plan. The EU allies relied on the USA. Nobody stepped up; our military success became a political disaster. The political vacuum saw Libya fall into an abyss. Today, there are growing signs that Russia may seek to fill that vacuum, and increase its involvement on Europe’s southern border. I do not yet believe Putin has a fully-fledged game plan for Libya. Moscow has shown its support for Prime Minister Serraj’s main rival General Khalifa Haftar. A diplomatic initiative is possible, but there are no signs of it before Russia’s Presidential election next spring. It is more likely that Putin will keep a level of interest in Libya alongside support for the opposition force – so that he is given a space at the table when discussing Libya’s future. NATO allies should remain suspicious of Putin’s intentions on Europe’s southern neighbourhood. Italy should be especially aware of Russia’s ability to destabilise the situation in Libya, with significant knock-on effects on this side of the Mediterranean. Because Italy knows only too well how destabilised and war-torn countries generate migration and refugee flows to Europe. In Syria, for those that believe Europe and Russia have a common enemy in Daesh, let me make my views clear: Putin did not intervene in Syria to kill terrorists. He intervened in Syria to protect Assad. There is significant evidence to show that Russian forces led indiscriminate attacks on urban areas, especially in the early part of their campaign. This exacerbated Europe’s migration crisis that has arguably done so much to destabilise mainstream politics in Europe, as evidenced by the recent German election result. NATO of course can play a role in stemming these flows, and NATO’s Operation Sea Guardian works closely with the EU’s Operation Sophia. However, in the short term at least, it seems that Russia’s intervention in Syria will cause Assad to win the civil war, giving Russia a client state in the Middle East. NATO allies will need to find a formula for dealing with this sad and potentially destabilising reality. When it comes to the fight against terrorism, NATO can play more of a role, especially in preventing the flow of foreign fighters and potential radicalised terrorists on its southern flank. The EU is already taking significant steps to increase systematic checks at its Schengen borders, but NATO’s niche can be in training local forces in terrorist hotspots. Currently, NATO has relatively small-scale training missions in place, such as in Iraq. Small-scale missions are producing small-scale results. If we are serious about NATO playing a role in fighting terrorism, the Alliance needs a billion-dollar fund and a dedicated training headquarters to complete this task effectively. With the USA reassessing its strategy in Afghanistan, there is never a more important time for NATO to think about its capacity in this area. Finally, I would like to end where I started – on the need for transatlantic unity in our dealings with Russia. This summer, we saw a worrying wobble. As the US Congress sought to strengthen economic sanctions for Russia’s election interference, some vested interests in Europe feared the new measures could hurt them. In particular, the supporters of the Nord Stream 2 pipeline feared the sanctions could target their own interests. While personally I believe Nord Stream 2 is a geopolitical error, it is also clear that it was never the target of the sanctions bill. The White House took steps to reassure European allies. However, the incident was concerning, because it showed how easily European allies could seek to put narrow commercial interests before a much broader point: that unprovoked aggression has to come with high costs. Failure to enforce this basic principle of the rules-based order would embolden dictators and autocrats around the world. That is why, whenever it comes to Russia – whether the challenge exists on our eastern flank, or our southern flank, there is a constant thread that must run through our response: the enduring strength of our transatlantic alliance.